Civil Engineering Companies in Thailand have for a long time been dominated by foreign companies mainly European and Japanese. Major infrastructure projects like railways, roads, bridges and tunnels have been built almost exclusively with the help and expertise offered by foreign civil engineers. Nowadays more wholly owned Thai civil engineering companies are bidding and winning these choice projects. Italian-Thai is a good example. 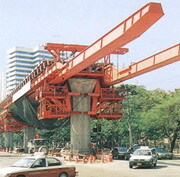 Right now they are building the extensions to the BTS overhead commuter railway system that is so very important to the future progress and development of Bangkok. Do you have a project that needs a good Thailand civil engineering company? then please email bangkokcompanies@gmail.com with your requests.